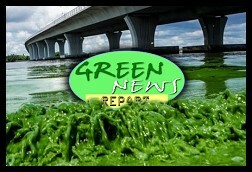 " Articles in Category: Ireland	"
IN TODAY'S RADIO REPORT: Toxic algae bloom chokes Lake Okeechobee, threatening drinking water and more in Florida; Ohio takes belated steps to curb toxic algae on Lake Erie; Summer night temperatures are rising faster than daytime temperatures; Record number of Americans now accept that climate change is real, and caused by humans; PLUS: Ireland set to become the first nation in the world to divest from fossil fuels... All that and more in today's Green News Report! 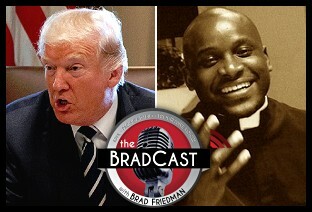 First up, Trump's recent comments and actions to sabotage American health care are, as I argue, in violation of his sworn oath to "protect and defend the Constitution", which includes the Article 2 requirement that the President must "take care that the laws be faithfully executed." At the same time, Republicans continue to block gun safety legislation, even after 58 were murdered and more than 500 wounded in a matter of minutes by a gunman in Las Vegas just over two weeks ago. But while such mass murders make momentary headlines and gun safety legislation continues to be mired at the state and federal level --- thanks to the arms industry representatives of the terrorist-enabling National Rifle Association (NRA) --- very successful efforts to curb gun violence in the areas that need it most go largely overlooked by both Democrats and Republicans alike across the country. We're joined today by PASTOR MICHAEL MCBRIDE, National Director for the LiveFreeUSA.org campaign, comprising hundreds of faith congregations throughout the US committed to addressing gun violence and mass incarceration of young people of color. McBride explains how, despite the organization's remarkable success rate in curbing gun violence in minority communities (see his recent NYTimes op-ed), such programs are often shamefully overlooked or ignored by public officials. "We have been able to, over the years, figure out strategies to target those at the highest risk of shooting and being shot. And help make sure that their lives are saved, their lives are redirected, they're behavior is transformed and changed," McBride explains. "And, most importantly, we have communities that are not over-determined, that are not traumatized, that are not filled with fear because of the prevalence of gun violence." "We believe that these are the strategies that we can implement and fully resource at the local level, without having to change the policies or get bogged down in a 2nd Amendment argument," he tells me, explaining how it can be done without over policing as well. "Too often in the black community, in poor communities, brown communities, racial profiling is used as the primary tool to try and identify these individuals, and that creates a 'collective punishment' kind of environment, where everyone in the community who looks like a 'criminal' is then treated as one. And we have found that that is not only unconstitutional, but it is certainly not effective." McBride, who served as an Advisor on President Obama’s Faith Based Advisory Council for Faith-Based and Neighborhood Partnerships, explains "we have found, consistently in cities across the country where this is done, decreases in violence in the first 18-24 months that can be as low as 30% and as high as 60%. Those numbers are unprecedented." He adds those numbers are achieved "without more arrests, without more incarceration" and even result in drops in police shootings, misconduct charges and complaints. As to why such strategies are too often overlooked by politicians of all stripes, McBride argues that "'tough-on-crime' [policies] and growing police departments and building more prisons has been a bipartisan slam-dunk for those who want to seem they are being responsive" to neighborhood gun violence. But, these "very much underfunded" programs work and are far less expensive than too-often tragic alternatives. He describes it as "the cost for peace vs. the cost for death". Please tune in for this highly informative conversation with more details than I can properly relay here. IN TODAY'S RADIO REPORT: Hurricane Ophelia batters Ireland --- yes, Ireland; Firefighters gain ground against deadliest wildfire week in California history; Desperate Puerto Ricans obtaining water from toxic Superfund sites; PLUS: Search for missing worker suspended after oil rig explosion in Louisiana... All that and more in today's Green News Report! We've been reporting on the two-term, 'Tea Party' dimwit for years, describing him variously as both the nation's dumbest Governor and the worst in history. But now, at the seeming climax of a months-long saga concerning racist comments by LePage, a threatening and obscene voicemail he recently left for a Democratic state lawmaker, comments about shooting that lawmaker in the head and, this week, an apparent emergency intervention by GOP state legislators, the possibility of resignation --- or, perhaps, mental breakdown --- is seeming likelier by the minute. 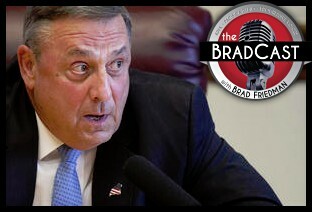 We cover that insane story today, how this loon became a two-term Governor in the first place in an otherwise not-insane state (hint: you can thank third party challengers), and how, even after all of the years of LePage's various embarrassments, Donald Trump has said this month that he'd be delighted to consider the Maine Governor for a role in his White House cabinet! 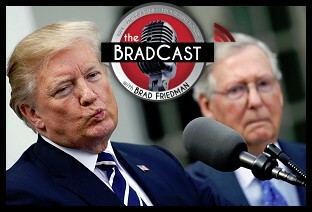 Good news and bad today on The BradCast. 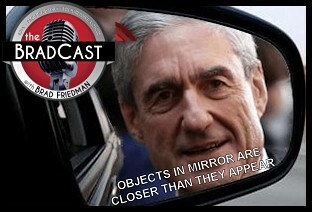 As is too often the case, mostly bad. We get the good news out of the way early. Namely, the overwhelming approval by voters for a Constitutional amendment for marriage equality in the very Catholic nation of Ireland over the weekend. 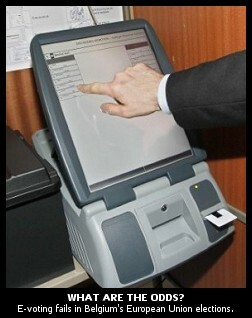 The mandate was loud and clear and, thanks to publicly hand-counted, hand-marked paper ballots in Ireland, unmistakable. Then, horrific, deadly flooding in Texas and Oklahoma on the heels of a years-long drought there. 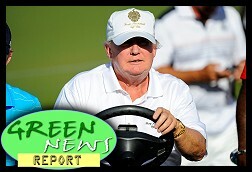 Mashable.com's Science Editor Andrew Freedman joins us to discuss the ongoing disaster and the influence of climate change on events like this --- which we seem to be seeing more and more of...just as climate scientists have been warning for decades. 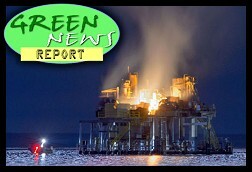 Also today, a report on our own weekend encounter with private security guards at the scene of the Santa Barbara, CA oil spill after the rupture of a crude pipeline owned by a company named Plains All American. An update on charges now filed against Doug Hughes, the postal worker who landed his gyrocopter on the lawn of the U.S. Capitol in April to deliver a message about the need for campaign finance reform (our full interview with Hughes from back in April is right here). 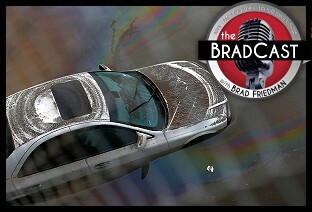 All that, and a few more items of note in today's BradCast!